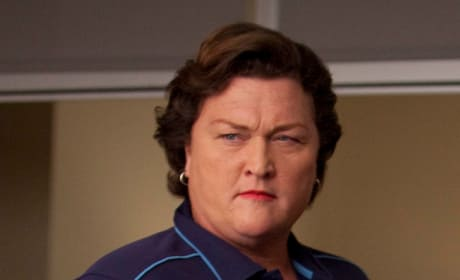 As Coach Beiste, Dot Jones has been a great addition to the Glee cast. She's a unique character. Sunshine can seriously sing! 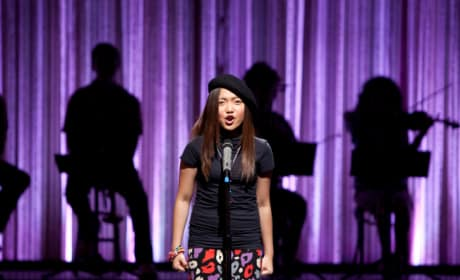 Too bad Rachel messed everything up and she's now a member of Vocal Adrenaline. Finn and Rachel will be a legitimate couple on season two of Glee. Expect a lot of PDA, as evidenced here. New Directions kick back and watch the stage in this scene from the show's second season premiere. The episode is titled "Audition." Almost the entire cast of Glee is pictured here in the episode "Audition." That's the title of the second season premiere. Will Puck and Quinn give their relationship a real chance on season two of Glee? They look chummy in this scene, don't they? Sue addresses Santana in this season two premiere photo. The former will be her usual, hilarious self throughout the season. Coach Beiste (guest star Dot Jones) is seen here with Will and Sue. It's a scene from the second season premiere of Glee.